Wadia Institute of Himalayan Geology, Dehradun has released advertisement for the recruitment of Project Scientist, Research Associate (RA), Junior Research Fellow (JRF) & Field Assistant (FA). Interested candidates may apply for this post on before 7th Oct 2016. This recruitment is for various project, all post will depend on project requirment. 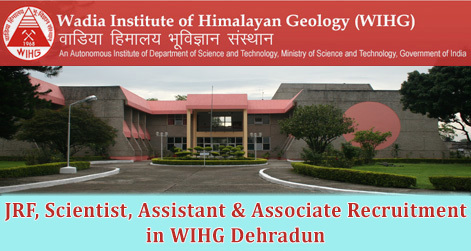 Wadia Institute of Himalayan Geology is an autonomous research organization of Department of Science and Technology, Govt. of India, undertaking advance level of research in all aspects of geology and geodynamics of the Himalaya. It has strong specialization in the areas of Petrology and Geochemistry, Structure and Tectonics, Sedimentology, Geomorphology, Paleoclimatology, Glaciology, Magnetostratigraphy, Biostratigraphy, Paleontology, Quaternary Geology, Environmental Geology, Seismology and Remote Sensing. Project Scientist 02 28 years Rs. 60,000/- p.m Ph.D. in Earth system sciences/Physics with Ist class in M.sc. in Geology/Geophysics/Geo Informatics/Physics. Junior Research Fellow 04 35 years Rs. 25,000/- 1st class M.Sc./M.Tech. in Geology/Applied Geology/ Geoinformatics/ Physics. Selection will be made on the basis of candidates performance in interview. Interested candidates can download the The prescribed application form for the above positions which is available on official website www.wihg.res.in. Candidates are requested to send fully filled application form in the given address on before 7th Oct 2016 till 4.00 pm. Help us to improve this article/job posting "JRF, Scientist, Assistant & Associate Recruitment in WIHG Dehradun". We would be glad if you can comment below and provide your valuable suggestions and feedback. If this page have any wrong information/list or out of context content, then you can report us as well.